But some Keynesians keep pretending that demand is the only problem facing the world. It’s not; the supply side has been gradually deteriorating for more than a decade. Brexit will make this problem even worse. Political outsiders have had quite a good year in the United States (and elsewhere), and many pundits have attributed their success to voters’ profound dissatisfaction with the economy. Certainly there is plenty to be dissatisfied about, including growing inequality of income and wealth and stagnation in real wages. 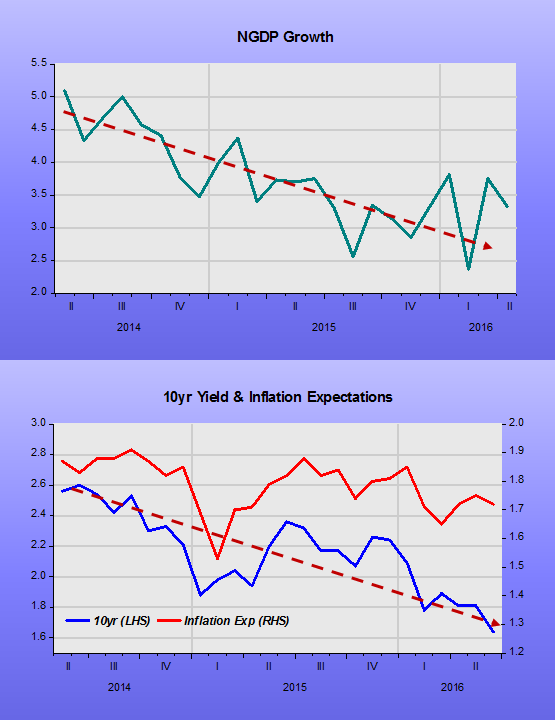 But there are positives as well, including an improving labor market, low inflation, and low gasoline prices. How do people really feel about the U.S. economy? In a highly polarized environment, with echo-chamber media, political debates often become shrill, and commentators and advocates have strong incentives to argue that the country’s future is bleak unless their party gains control. In this environment, it seems plausible that people will respond more intensely and negatively to open-ended questions about the general state of the country, while questions in a survey focused narrowly on economic conditions elicit more moderate responses. 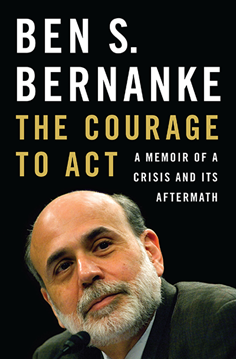 Without doubt, the economic problems facing the country are real, and require serious and sustained responses. But while perceptions of economic stress are certainly roiling our national politics, it may also be that our roiled politics are worsening how we collectively perceive the economy. 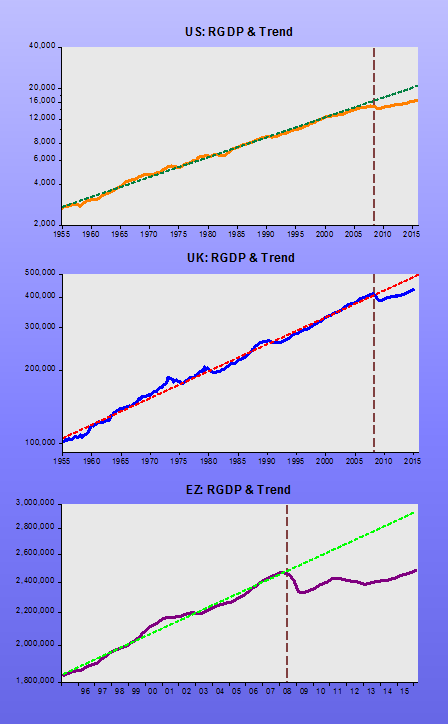 For many years (decades in the case of the US and UK) before the “crisis”, the big developed economies (ex-Japan) were doing well. 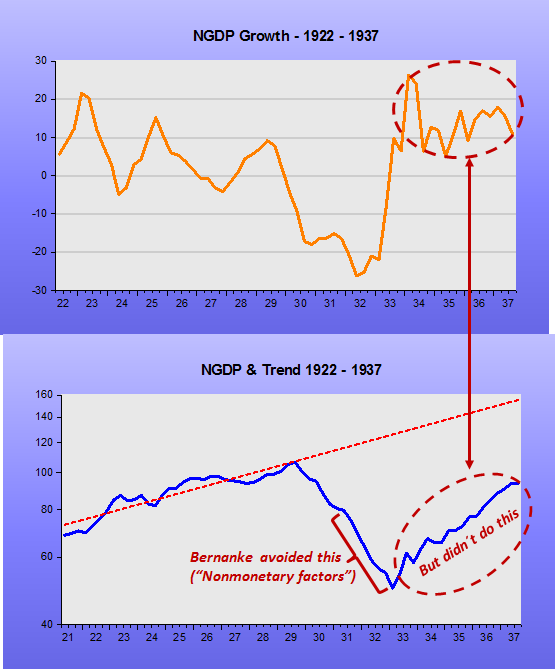 There was no suggestion of “new normal”, “great stagnation” or “depression”. The “supply-side” seemed just fine. Suddenly, almost as if central bankers were perfectly “coordinating”, those economies were walloped! 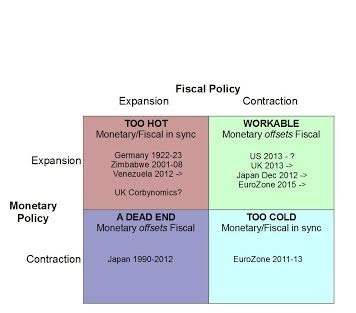 The first panel shows how central banks were de facto targeting NGDP-LT. 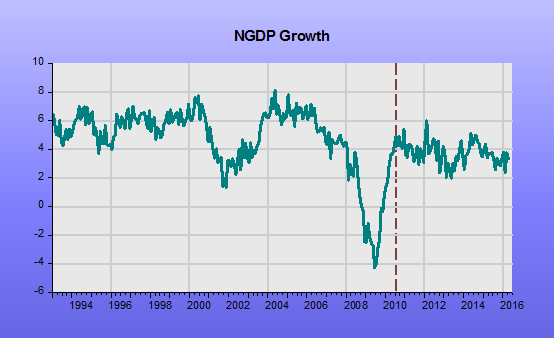 The result was nominal stability (that includes low/stable inflation). Maybe because they thought they were targeting inflation, when oil prices pressured headline inflation they simultaneously freaked. When central banks pulled up the hand brakes with force, the real economy was squeezed. As I argued here, the Fed (and the other central banks) seem to be happy with where the economies are. And if they are happy, that´s where they will stay, mired in depression. Note that the EZ central bank even acted more destructively, bashing a weekend economy over the head after it had already fallen to its knees. 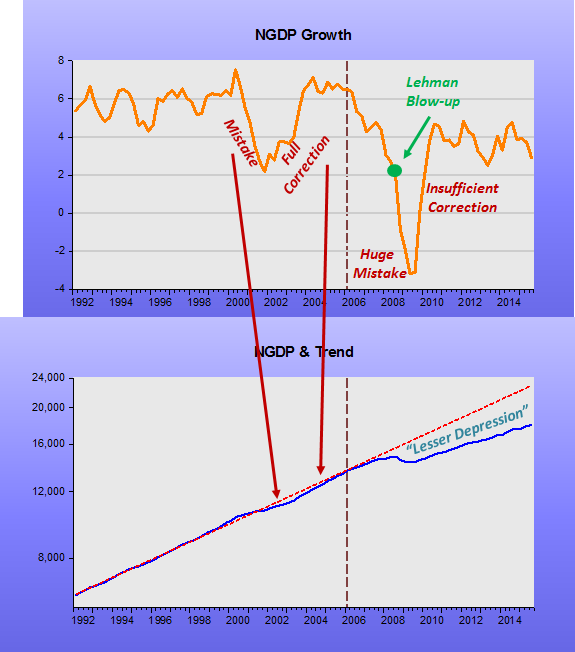 Scott Sumner made a somewhat light-hearted comment in a recent post that “no-one can predict recessions”. It made me stop and wonder what was the point of Market Monetarism in that case. 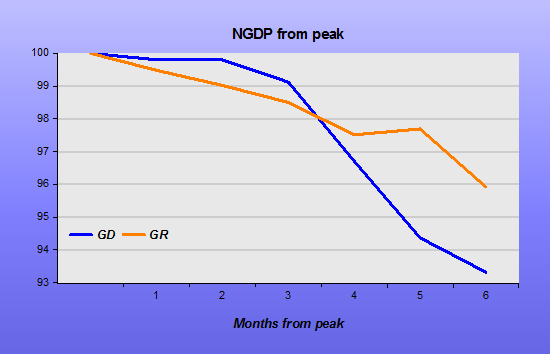 The essence of MM is that market forecasts of NGDP Growth should guide monetary policy, should be monetary policy. Fair enough. But does this imply, in the case of a negative demand shock, which increases money demand, an immediate increase in base money supply? Perhaps it does and we will all be very happy. In our imperfect current world where the monetary authorities seem to mostly target less than 2% Core CPI two years out, the markets will still anticipate the impact of this goal on monetary policy and therefore on both real and nominal economic activity. But markets are nothing more than numerous individuals, or trading robots programmed by individuals, making investment decisions. 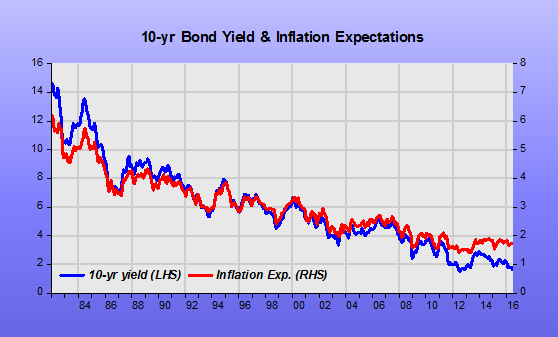 Some will certainly forecast recessions and invest appropriately. Is Scott saying that these people are inevitably going to be wrong? The Efficient Market Hypothesis (EMH) may say that it is impossible to be right all the time, to consistently beat the market, but it doesn’t and won’t stop people trying. 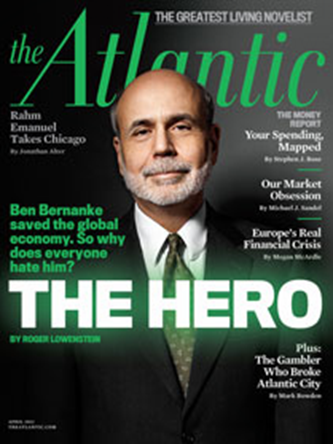 Indeed, people have to try to forecast the future or Market Monetarism would not work. You have to have markets for Market Monetarism. Scott has correctly advocated a specific market for NGDP Futures, but all financial markets are essentially futures markets, in the sense of forecasting or predicting future streams of revenues from assets, either income or some capital gain. Is Scott saying no one can forecast future streams of revenues? Perhaps he is just being careful, like most academic economists. The most famous economist of the twentieth century, J M Keynes, was of course famous also for his financial acumen. Putting his money where his mouth was, or at least putting his money to work in a highly successful way. Perhaps he made his pile by inside information, who really knows, but successful at forecasting asset price movements for money he certainly was. Scott Sumner, like many, was very taken with the latest average hourly earnings figures. The tick-up seemed to be breaking a very dull trend and taking the growth rate back up to the heady heights of 2007. Unfortunately, the series he used – average hourly earnings for all private sector employees, seasonally-adjusted – only goes back to 2007. The much more traditional series for private sector non-supervisory and production employees goes back to 1965. This chart is perhaps a better guide to the long-run trends. It is far harder to spot any significant trend breakout. Also, the bigger data set includes many more service sector employees where hourly earnings aren’t a particularly relevant measure of pay. There are 120 million total private sector employees, but only 20 million of them who are outside (above?) the non-supervisory and production category. It should be a simple matter to check the average hourly earnings of the 20 million supervisory and non-production workers but it isn’t. There doesn’t seem to be a dataset released for that, indicating to me at least that it isn’t a robust data set. It’s not on FRED and it’s not even on the Bureau of Labour Statistics website. There are some (very old) discussions about how the hours for this segment are calculated, but not a lot of recent statistical material, if any. I think this makes it highly dangerous to rely on the all private workers average hourly earnings growth figures. The seasonal adjustments may also be harder to do and often lead to large revisions. The non-seasonally adjusted version of Scott’s chart looks a lot less compelling. In the absence of any guidance from the BLS that I can find I did a some simple calculations to find out the average weekly pay of the “white collar” employees. It is more than twice that of the “blue collar” staff. And the gap must be growing given the recent trends in the two indices in the first chart. 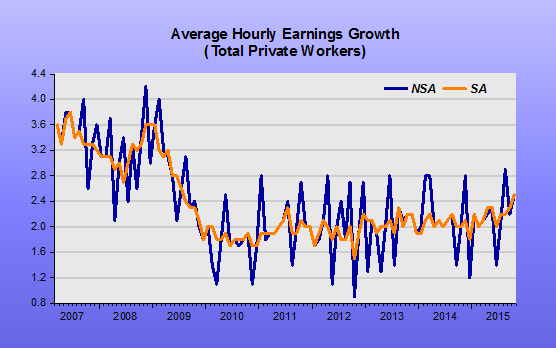 If I was to derive a longer term chart for the growth in “white collar” average earnings per hour then I bet I would find a very volatile series indeed. 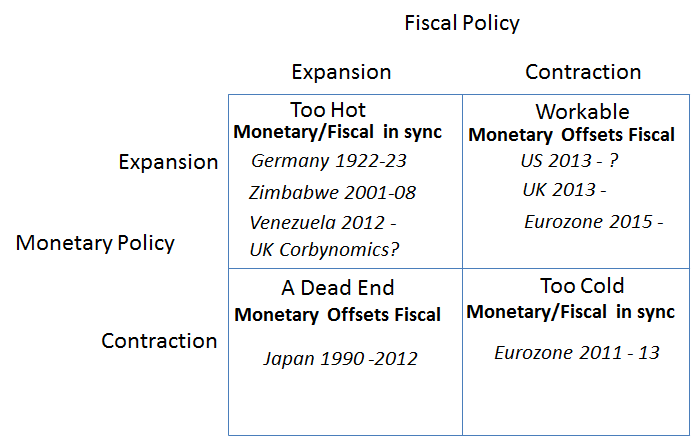 The question is then: should this highly volatile, not particularly robust, sub-series drive monetary policy? Of course, not. All this discussion is a bit beside the point given the horribly low and lower overall inflation figures and the negative growth in US$ base money. The Fed is still wedded to the output gap/Philips theory of inflation and it has been proven wrong – no respectable mainstream economist who believes in basic macro would have predicted a halving of the US unemployment number without a major rise in wages. They (and the central banks) need to rethink their macro, it is time for them to ‘fess up and stop worrying about such ad hoc concepts as “secular stagnation”. 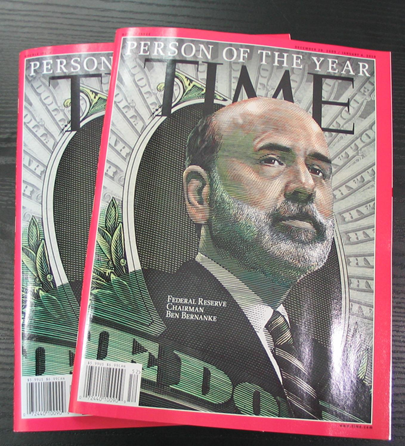 Just as the inflationistas have had to rethink their understanding of macro – I should know, I used to be one. 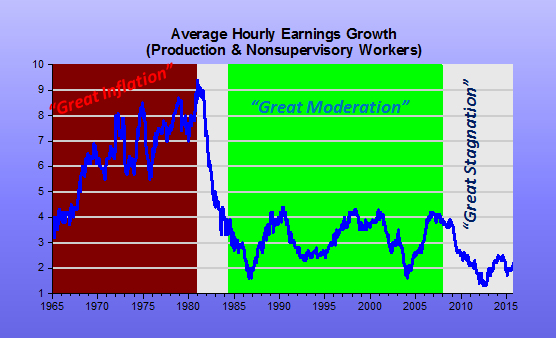 Money drives nominal growth and wages, and good nominal growth allows strong real growth. Yellen’s focus on the under-employed is steering monetary policy toward a bold experiment: The Federal Open Market Committee will use the big, blunt instrument of low interest rates to push the jobless level low enough to pull more labor-force quitters and part-timers back into full-time work. The hope is that it will kick-start a virtuous cycle of investment, higher productivity and better pay that will heal the vestiges of the worst recession since the Great Depression. Most (all) of the people involved in the 1929 and 1937 BIG monetary mistake are dead. But history books, contemporaneous articles and “modern” analysis are still available (a new item, Scott Sumner´s opus on the Great Depression will be available December 1). Therefore, to call low (“zero”) interest rates a “big, blunt instrument” is hilariously shocking! For what it’s worth, I did take the shorter, but still challenging course on Scott Sumner’s blog, as well as slogging through a BSc Econ more than a few years ago. However, this misses the point somewhat. It is not just a “measurement error in real time” that markets are dealing with. 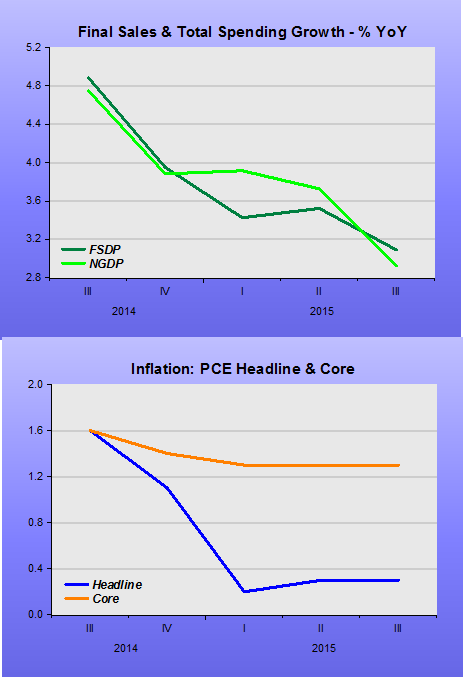 They want to know: What is the Fed or the BoE trying to measure? What are they targeting? These are deeper questions than mere “measurement error”. And why have central banks picked 2% as the inflation target? Where is the rigorous model on that? Where is the academic model for that 2% becoming a ceiling? The market understands all this confusion, or as Yates’ sweetly put it “many [questions are] not resolved conclusively”. The markets actively try to sum it all up in prices, in real time. Yates et al’s beloved “long and variable lags” are merely the arithmetical part of the markets’ realtime NPV calculations. So why not use that market consensus, on the state of the economy (aka “real time measurement error”) and the state of mind of the central banks (aka “changes in committee membership that meant changes in the preferences of the median committee voter”), to steer monetary policy. 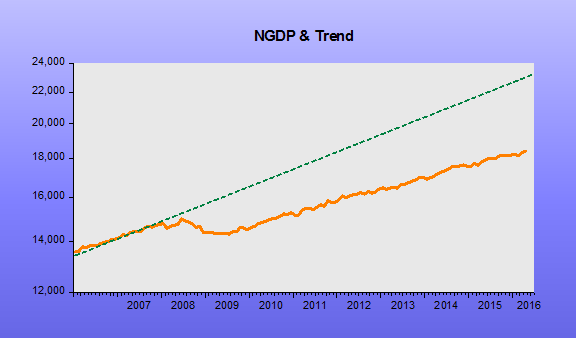 That is, use targeting of market forecasts for NGDP Level Growth? Why the fear of markets? It’s a real puzzle. 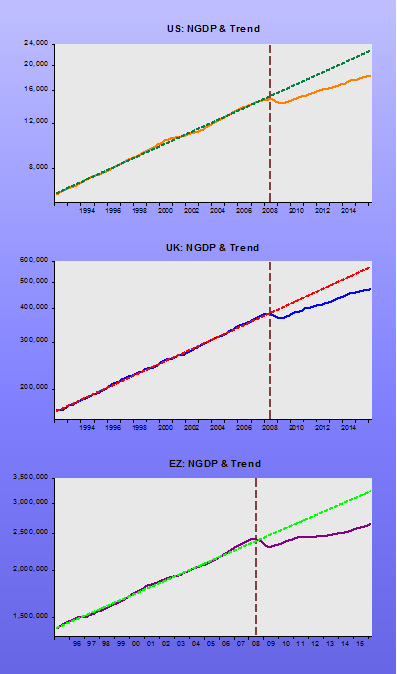 I suspect many academic economists, UK ones especially, under-rate the market because they are so far removed from it. Most have final salary pension schemes, or presumably like Yates, also Bank of England/civil service like gold-plated, index-linked, unfunded ones. They think they have no direct stake in the markets and end up being dismissive of the whole thing. I would recommend they go and sit and ponder the £5bn deficit in the academics’ own pension scheme and worry about how to fund those far-off liabilities, the ones linked to future inflation and future interest rates and many, many other assumptions about the future. And find investments that can deliver against those assumptions in a low-risk, low volatile way, via real financial and other assets. It’s tough. Great and serious minds worry about this question. UK academic economists seem oblivious, yet their financial future rests on their fund making the right investments. On forecasting how markets will turn out. It’s not just an academic exercise but a real one. Markets are for real people like you, too, not just speculators. Of course, maybe they expect the government to nationalise the university scheme like it did with the UK Post Office, take the assets, reduce the public sector debt and just add yet more unfunded liabilities onto the state sector balance sheet. Or rather off the balance sheet. Nationalisation would reduce some risks as it would provide a state guarantee. But what will the guarantee be worth it in 30 years time given the restrictions already starting to be imposed? Not trying to worry you guys or anything.